Part 1 of Samurai Gamer's Fate Grand Order Beginner's Guide! 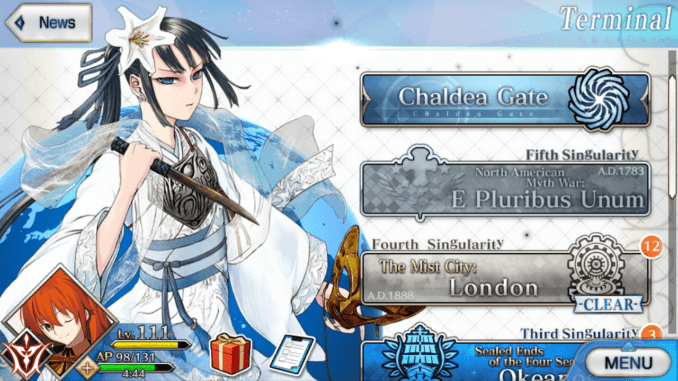 Here, we explore the functions of the Main Menu in Fate Grand Order. The Main Menu in Fate Grand Order has a variety of things. Upon entering, players will find themselves face to face with the News page. Once they exit, they’ll find themselves in the Main Menu. It can be a lot to take in but, don’t worry! We’ll be walking through this one by one! At the lower left, they’ll find a gift box where they can claim their daily login rewards. Next to that icon would be the checklist that has the Master Missions which players can accomplish by going through a set of missions. These missions refresh weekly and give 14 Saint Quartz Fragments weekly, giving an equivalent of 2 Saint Quartz a week. EXP: This appears with a golden bar at the top with your level right next to it. Near the golden bar, you’ll also see the amount of EXP required to reach the next level. The max level for players to reach is 130. No. of Servants: This takes into account all the servants you’ve summoned in your over-all play through of Fate/Grand Order. 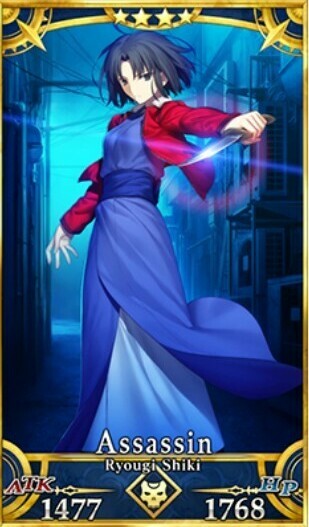 As of now, there are only 300 servants in Fate/Grand Order. No. of Craft Essence: This takes into account all the craft essences you’ve summoned in your over-all playthrough of Fate/Grand Order. As of now, there are only 300 craft essences in Fate/Grand Order. 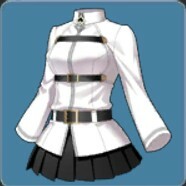 Saint Quartz: These are the items that allow you to summon your servants. It is the only key you have to summoning your waifu or husbando. Rare Prisms: These only appear if you burn a 4 Star Servant or higher. Players can spend the Rare Prisms in Da Vinci’s shop. 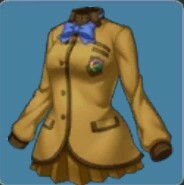 Mana Prisms: Mana Prisms are items players can exchange in Da Vinci’s shop for better items. Players can earn this by finishing the Daily Quests once and burning 3 star and higher servants or craft essences. 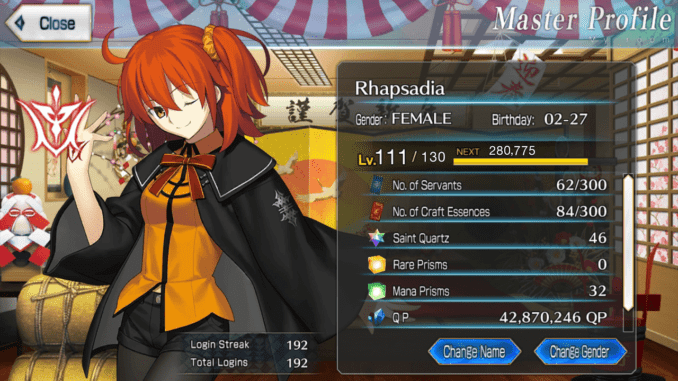 QP (Quartz Points) – QP are crystals players earn by finishing battle in Fate/Grand Order. Login Streak: The Login Streak takes note of how many times you’ve logged in consecutively without missing a day. At a certain point, players receive prizes for logging in more than 10 times, 50 times, 100 times, 150 times, 200 times, and further increments of 50. Total Logins: Total Logins is the amount of times you’ve logged in to your game. This number will change even if the logins are not consecutive. Formation: Players here can arrange their team and equip craft essences before diving into battle. 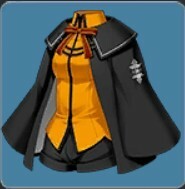 Here, players can also arrange a set of servants who can assist any of those on their friend list. There’s also an over-all collection in the Spirit Origin option where players can check which servants and craft essences are missing. Enhance: The Enhance Menu contains multiple options: servant enhancement, craft essence enhancement, noble phantasm enhancement, ascension, skill reinforcement, and Palingenesis. Summon: Players can call new servants from the Throne of Heroes to join them in battle. 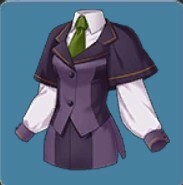 Shop: Also known as Da Vinci’s shop; players can go here to exchange Saint Quartz Fragments, Mana Prisms, and event items to get certain items. Friends: Players can send and accept friend requests here. My Room: Players here can perform a variety of functions such as watching interludes and animations, speaking to their servants to unlock voice lines, getting a data transfer number to bind their account, and checking how much ascension and skill reinforcement items they have. 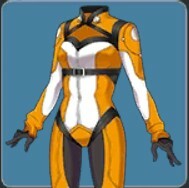 If you’ve noticed in the main menu, you’ll spot tabs with the word “singularity” on them. 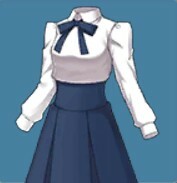 Above them all, is a tab reading “Chaldea’s Gate”. The singularities are the main story quests where players will have a chance to play through the story of Fate Grand Order in order to earn Saint Quartz, unlock new servants, and open new Free Quests to farm from. 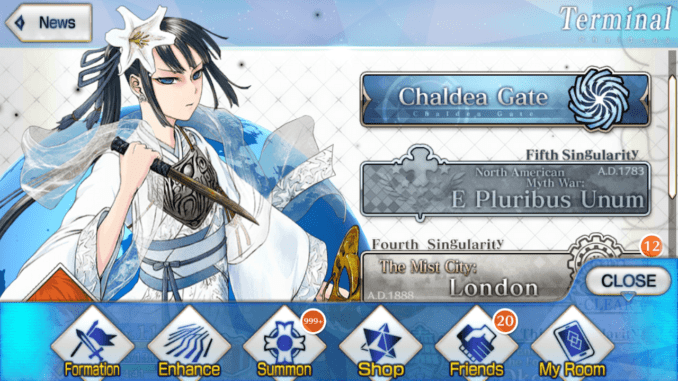 Chaldea’s Gate on the other hand houses the event quests and the daily quests. In Chaldea’s Gate, players will also have a chance to check if their servants have interludes which will allow them to either a) strengthen the power of their servant’s Noble Phantasm or b) grant you a saint quartz along with updating their profile page.